Find farms near Wheeling, Harpers Ferry or Charleston on our list of West Virginia pumpkin patches. Many have entertainment including corn mazes, haunted houses, hayrides, general stores, petting zoos, and children’s activities. Most open mid-September for pumpkins and Halloween type fun. Find some of the best pick your own pumpkin patches in West Virginia below. 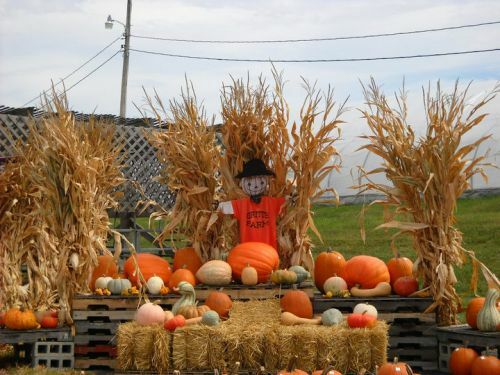 Also do not miss the West Virginia Pumpkin Festival held in October 2018 in Milton, WV. Glencoe Farm is a 7th generation farm with (currently) 175 acres that has been run by the McDonald family since the late 1700s. Enjoy the pumpkin, hayrides, 5 acre corn maze, playground, petting zoo, kiddie korn kastle, zip line, corn table, tube slides and antique tractor display. Open Saturday and Sunday starting September 22nd. A family owned farm started by George S. Orr, Jr. in 1954 and continued by his family. They opened their retail market in 1995 and offer a variety of pick your own crops, including pumpkins. The pumpkin patch is open from mid-September to Halloween. Enjoy the hayride, small corn maze and pick a pumpkin. Sorry folks this farm is now closed for fall events. Join them for a hayride and pumpkin picking this fall. Also available at the farm are a corn maze, petting zoo, mini hay maze, and fire pits. Take a free wagon ride on the weekend to the 4+ acre patch. They generally do featured special events on certain weekends in late September and October, such as a bbq, selling apple butter, making apple cider, and carving pumpkins. They also have a corn maze, corn cannon, farm animals, snack/refreshment stand and a picnic area. Note: They do not take debit or credit cards. They are located about 51 miles west of Lewisburg at 614 Blue Jay 6 Rd, Cool Ridge, WV 25825. It features a corn maze, zombie paintball, pumpkin patch, Field of Screams haunted corn maze and zip lines for the whole family. They open September 8th this fall with parking at 1 Panther Trail, Milton, WV 25541. It is approximately 33 miles west of Charleston, WV. It features pick your own pumpkins plus a huge corn maze, hay slide mountain, kid’s hay maze, hay rides, kid’s activities, campfires, and apple cannons. The farm is located at 355 Gritt Road, Buffalo, WV. It is approximately 35 miles northwest of Charleston, WV.